When Eleanor Catton's The Luminaries was declared the winner of the 2013 Man Booker prize, almost every article and review drew attention to the fact it was the longest novel ever awarded the prize and Catton the youngest ever winner. Much was made too of the genre affinity between Catton's work and that master of the sensation novel, Wilkie Collins. Most reviewers seemed to agree with the Booker judges who called it “extraordinary, luminous, vast,”. The only dissenting voices came from the panel convened by one of the UK tv channels the night before the award who admired Catton's technical virtuosity but didn't feel it was the best book of the year, and David Sexton in The London Evening Standard who argued that a stunning feat of construction didn't necessarily equate to a great book. Having now read this 832-page tome, I find myself more in David Sexton's camp than that of the Booker judges. That isn't to say I didn't enjoy the book. I did. Catton really knows how to tell a good story (but then she'd have to be good at this in order to keep people engaged through such a lengthy book). Her plot is intricately crafted and she manages the multiple story lines deftly, making you want to keep turning the page to find out what happens next in this tale of death, deception and doomed love set in New Zealand during the time of the gold rush. The book opens on a stormy night as the young Scottish lawyer Walter Moody, lands on the shores of Hokitika, a town hurriedly constructed to service prospectors seeking to make their fortune in the surrounding hills and rivers. Shaken by an incident on the boat he goes into the first hotel he comes across, badly in need of a restorative drink and a bed for the night. He finds himself in a room of 12 men who slowly begin to reveal their unease about some strange recent events in the town involving a whore, a dead hermit and a missing fortune. Together these 12 luminaries set about trying to get to the bottom of these events by piecing together the knowledge each of them holds. Although they are not constituted as a jury they do weigh up the evidence from each man's version of events and make judgements about some of the people involved. Catton made much of the fact that she structured her novel on astrological movements, using a software programme to help her pinpoint the exact positioning of the stars corresponding with events in the book. Each chapter begins with an astrological chart indicating which characters are in ascendancy on the date in question. I tried to follow this but couldn't see much beyond the fact the chart indicated which characters would be the focal point of the chapter. It felt like an artifice that didn't add much to our understanding of the story. All the elements are there for a darn good read. And yet, for all its technical prowess, there was something missing from this book. It was difficult at first to pin down what that missing element was but eventually it dawned on me that what I was lacking was any sense in which the novel illuminated the human condition. Outside the plot there wasn't much else of substance, all was really smoke and mirrors and the characters just faded out rather than came more sharply into view the more we heard them speak. There was little that caused me to pause and reflect, in short there was little evidence of the emotional or philosophical weight that I expect from a Booker prize winner. And that's really my issue. 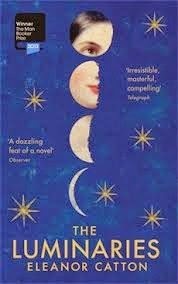 The Luminaries IS a really enjoyable, well crafted novel and is one of the best of its kind I have read in many years. But it's not up to the gold standard that the Booker should represent. How the judges chose this over Jim Crace's Harvest is just baffling. Nice to know that someone else thinks that Harvest would have been the better choice as winner. It was an engrossing book and the style was delightful and not in the least boring. Wonderful review. I'm been curious about this one because of an upcoming trip to New Zealand. I've seen mixed reviews and maybe going into it with lower expectations might be wise. I loved this story, but I get confused by the Booker judging criteria. Some of their winners I love; others are 'meh'. I can't work out what their main criteria is for picking the winner each year. It's a complete mystery! Terrific review, you captured a lot of my feelings about the book. It is lovely and interesting and I admired the craft. But while I was more and less attached to various characters none of them really captured me or lived on with me after I was done.